Really, CBS app? We understand the pride that comes with being "America's Most Watched Network," but one set of terms and conditions is plenty for most network applications that let you watch full episodes -- two at the most. Not for you! Four separate user agreements that nobody will bother to read? That level of attention to detail and user experience merits this weekend's No Comment. 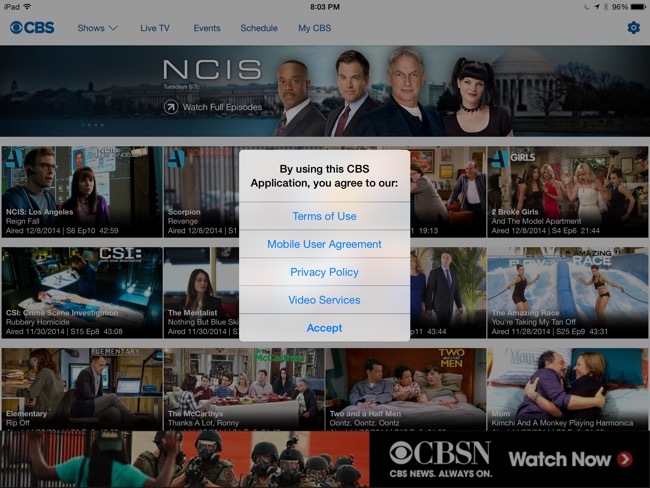 No Comment: CBS iPad app just needs you to sign right here originally appeared on TUAW: Apple news, reviews and how-tos since 2004 on Sun, 14 Dec 2014 19:00:00 EST. Please see our terms for use of feeds.